The Emory-Children’s Animal Physiology Core has acquired a Vevo LAZR photoacoustic imaging system, which is expected to be useful for monitoring blood flow and nanoparticles in vivo. The absorption of light produces sound waves. Inventor Alexander Graham Bell discovered the “photoacoustic effect” in the 19th century, but only recently did scientists began harnessing it to peer into the body with photoacoustic imaging. A main reason why light can’t penetrate into living tissues is because of light scattering, says associate professor of pediatrics Alex (Chia-Yi) Kuan, MD, PhD. Photoacoustic imaging steps around this obstacle by combining laser illumination with ultrasound detection. It is especially well-suited to seeing hemoglobin, which carries oxygen in the blood. The Emory-Children’s Animal Physiology Core has acquired a Vevo LAZR photoacoustic imaging system, with the help of a recently awarded $572,550 Shared Instrument Grant from the National Institutes of Health. 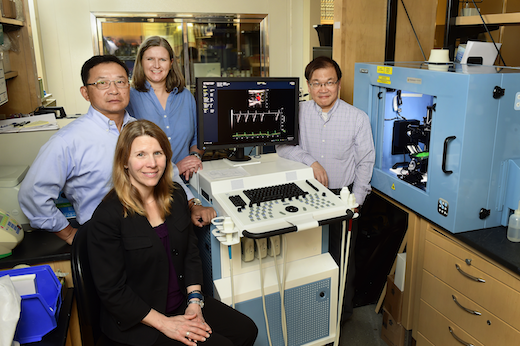 Kuan assembled the grant application, along with Hui Mao, PhD, professor of radiology and imaging sciences, Mary Wagner, PhD, assistant professor of pediatrics and director of the Emory-Children’s Animal Physiology Core, and Stacy Heilman, PhD, pediatric research program director. “This is an excellent example of how an outstanding researcher like Dr. Kuan with support from an integrated strategy for core facilities can obtain funding for equipment that enhances the research of many investigators at Emory," says Michael E. Zwick, PhD, supervisor of the Emory Integrated Core Facilities, the Assistant Vice President for Research in the Woodruff Health Sciences Center and Assistant Dean of Research in the School of Medicine. Researchers say that the imaging system will advance their studies of cardiovascular disease and cancer in animals, by allowing them to non-invasively monitor oxygen levels and visualize blood vessels, atherosclerotic plaques, tumors or anticancer nanoparticles. Kuan and his laboratory have used photoacoustic imaging to examine oxygen levels in the brain during an experimental stroke in mice. Several investigators at Emory, such as Lily Wang, MD, PhD, are planning to use photoacoustic imaging to track anticancer nanoparticles in the body. With the Vevo LAZR system, it is possible to see up to 36 millimeters into living tissue, with up to 40 micrometer resolution, according to Kuan. “This system integrates multiple imaging modalities to generate a rich content of biological information far faster and simpler than the combination of several imaging instruments,” he says. Younan Xia, PhD, part of the Wallace H. Coulter Department of Biomedical Engineering at Georgia Tech and Emory, has worked closely with a pioneer of photoacoustic imaging, Lihong Wang, and recently published a review of the technique with Wang in Annals of Biomedical Engineering. Xia, a Georgia Research Alliance Eminent Scholar, is working on developing gold nanocages for tracking stem cells in vivo.